This year, members of the LILAC Group will be hosting a half-day, pre-conference workshop on Wednesday, March 18, 1:30-5pm, and a panel presentation on Thursday, March 19, 12:15-1:30pm. We hope you will join us at one of these events if you are interested in learning more about the LILAC Project or in partnering with us, or, if you can't make it, email jwalker@georgiasouthern.edu for more information. 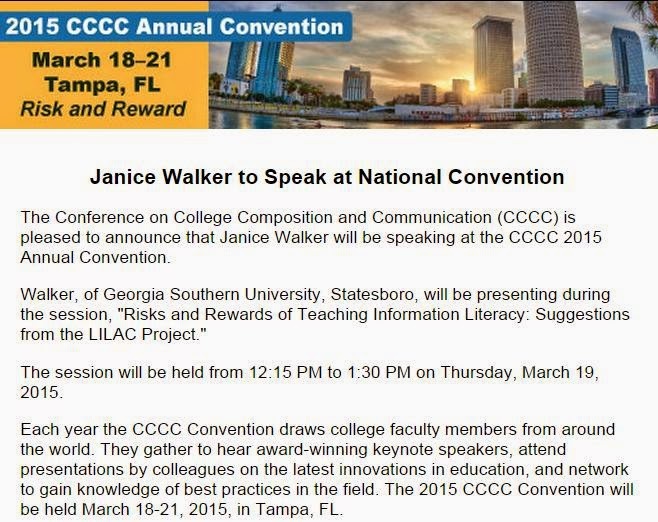 For more information, or to register for CCCC, visit http://www.ncte.org/cccc/conv/.